A few posts ago, I mentioned that I wanted to use my 2 year old Tri-Recs rulers for the first time. I was going to do a simple project that had Tri Recs blocks in it. Inspired by Joanne at Threadhead's Tri-Recs Show and tell and just going by one of her pictures, I began calculating and cutting fabrics. I finished the block components and then calculated the cuts for the side setting triangles. I laid out the blocks to make sure that everything was right. I realized that forgot to cut corner triangles. And all those calculations, I ended up with one extra set of tri-recs points. 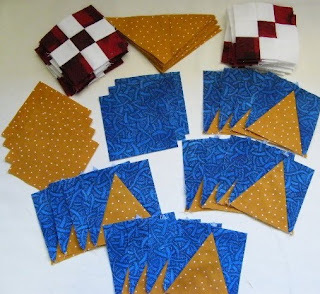 Yesterday I finished sewing the blocks together and put the borders on. I really like this runner, and I am so glad I finally learned how to use the Tri Recs. thanks Joanne. 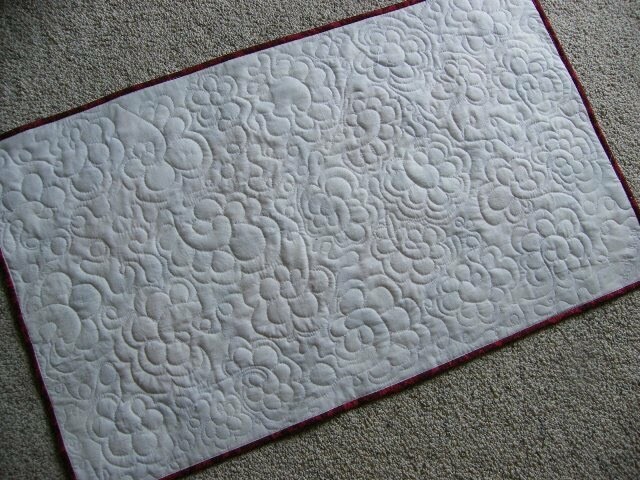 Next week, I'll be machine quilting many small projects that I've been piecing over the past few weeks, including this runner. I had my strata's sewed and already for the cutting of the wedges this morning. I had a hard time to cut the wedges from strata and I made a couple of mistakes. But through the mistakes, I discovered the proper cutting procedure. It was easy to cut one side of the wedge, but the other side required some tricky positioning, but I got it with the help of a second straight edge. My brain was tired when I finished cutting and I needed a break. I just couldn't see how it all went together. So I set everything up by my sewing machine and thought I would go for my walk and then work on another project for a bit and just continue the spiral tomorrow. During my walk and I thinking and thinking about the pattern directions. After all this thinking, I thought I understood what the instructions were trying to say. After lunch, I couldn't resist starting sewing. Well, t he process was different than I had thought through on the walk. :) But once I got started, the sewing was quite straight forward and quick. After a couple of seams, I knew I had it. I was really excited and relieved to see it come together. I really like the light stripe down the center. It is shown here on my wide ironing board, and measures about 20" x 40". A great size. The little jagged edges will be all cut to a smooth curve after all the quilting is done and just before binding. It's an amazing design and I can't wait to make another. 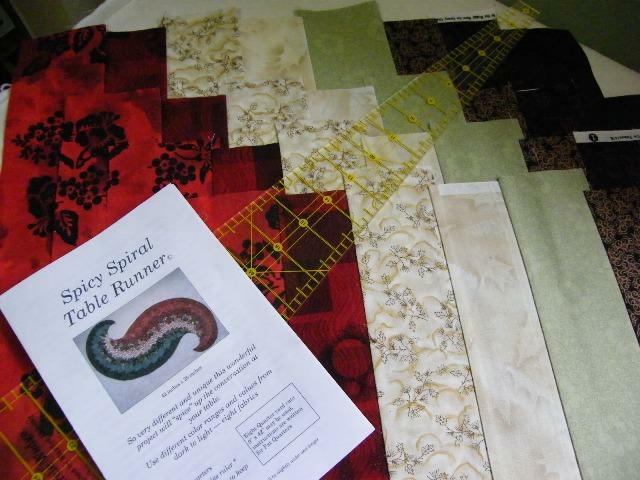 I'll layer and quilt this one next week along with a couple of other runners that I'm making. While I was in South Carolina, I happened to see a really different and unique small project. It's a Spiral table runner. I had a hard time to find the Spicy Spiral pattern to buy, but asking around, and ardent googling gave me some leads and I ultimately found it online. I ordered it, and it came by mail earlier this week. I also borrowed the 9 degree wedge ruler from my friend Lois, and I read the spicy directions front to back and back to front. There's a lot of numbers, fractions, and special little steps, so I'm being careful. Yesterday, I pulled 8 fabrics from my stash. Reds, creams, a light green and some blacks. 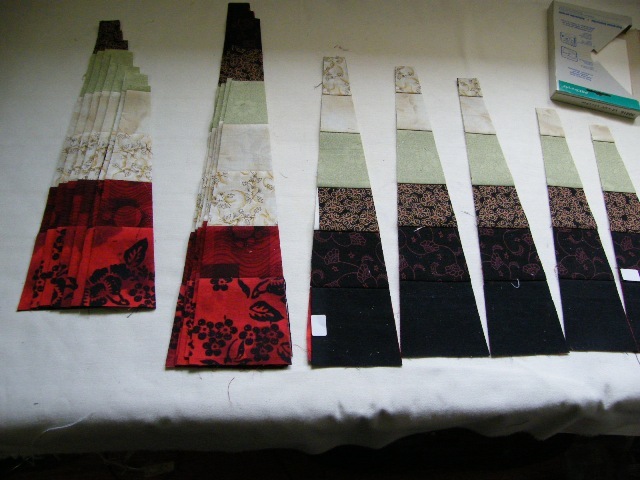 I have the first couple of steps done, which is cutting 4 strips of various widths of each of the 8 fabrics. Then sewing 4 sets of strata using the 8 strips. Tomorrow I'll move on to the next step. Post Note: If you are looking where to buy the pattern and the 10 degree wedge ruler, they are both available here at Phillips Fibre Art.. I'm so pleased with how my Batik Beauty turned out. I just put the binding on this morning. It's a little tricky to do bind curves, and then those 90 degree corners are a little intimidating. I took it slow and used lots of pins. 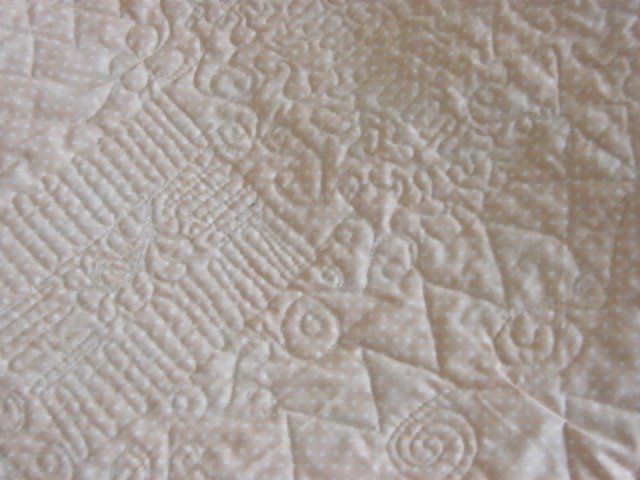 It was so hard to take a picture that showed the machine quilting, so that's a good lesson for me. 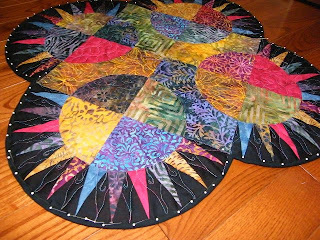 "Don't spend so much time trying to figure out quilting on a batik fabrics". Plain stippling will be just fine. You can get a peek at the stippling on the red quadrant here. Overall, the quilting looks great, but I do really like the echo of the points in the black background. This Beauty is now sitting on my dining room table and it looks stunning. Do you want to make your own Beauty, go here for the pattern at Sew Karen-ly's online store. 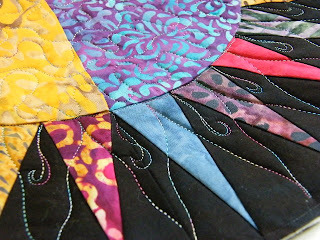 This finish is just in time, because the Friday Girls have another Batik project in mind, that is going to be so fun. You'll have to wait until we get started on it, before you can see it. I know you'll love it. I have my Batik Beauty all quilted. It was nice to play with my Juki for the first time in a few months. All that is left to do is the binding. My machine that has the quarter inch foot is in being serviced, but I'll have it back on Tuesday. I'll show you the finished Beauty then. It's always hard to decide on quilting. I put a ton of thought on how to quilt the center part but didn't actually come to a final decision until I sat down to stitch this morning. 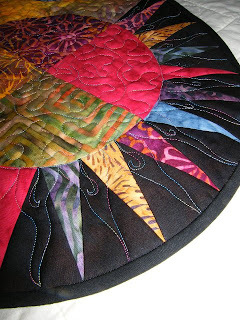 It turns out that the quilting on the center part doesn't really show up that good on the batiks. I'll try to get a better shot of it on Tuesday. 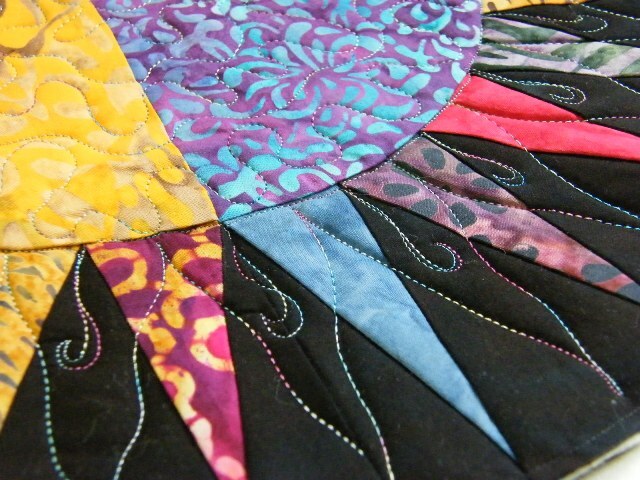 But I do love how the variegated thread shows up on the dark background of the points. It kinda represents little licks of flame, as in the a fireball. 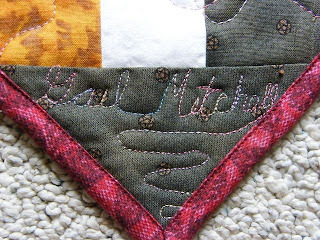 I guess, I would label this as organic machine quilting as opposed to eclectic like the stitching I did earlier this week on Lanaya's quilt. 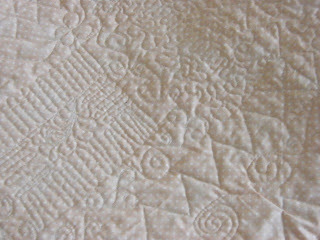 My organic as in lots of subtle curves, and no straight line quilting at all. BTW: Lanaya's mother loved the quilt. She looked at all the stitching and kept saying wow. She noticed all the little hearts. Like I predicted, she said, "Oh, I'm going to keep that for good", so I told her, to please please use it, and wash it lots, and I'll make her another in a couple of years. She said she would so that made me happy. She couldn't wait to show it to her aunt. I felt proud to give it to her. Aurora has been itching to take Abby for a walk. She uses this little stroller in the house , but a warmer day and a bit more sun is just too inviting. 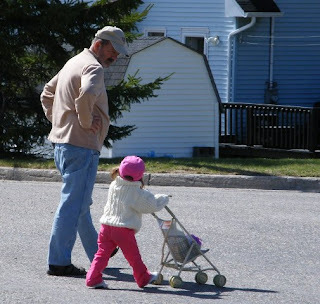 So Aurora got Grampie his shoes and they took Abby for a walk. This sweater that Aurora is wearing was given to her by her Aunt Mitch a couple of weeks ago. It fits Aurora perfectly and is great for this type of weather. It is actually a hand-me-down sweater that I had knit when Mitchell was a toddler. It was one of three sweaters that I knit for the triplets. Isn't it great to get handmade hand-me-downs. It doesn't seem like 6 years has passed since this picture of the 2 year old triplets was taken. I remember that I loved making these sweaters. The time is going by so fast!! It's hard to see the quilting on the front, so I'm showing you portions of the back. There's lots of texture and I'm sure it'll wear just fine. 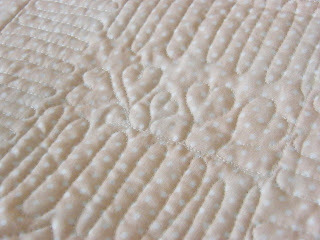 I quilted some hearts here and there in the quilt and I quilt wrote Lanaya's name in a few places, although it's hard to see. I also signed my name in a small sqaure the front of the quilt. It's very discrete. Sometimes when quilters give new mothers quilts, they don't feel they can use quilts and want to keep them for good. I'm going to be sure to tell her that it's the best compliment to a quilter to see a mom using the quilt. I'll tell her if she wears it out, I'll make her another. Do you know Abby? 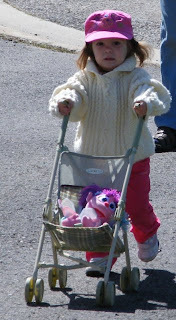 She is a Fairy-in-Training on Sesame Street. 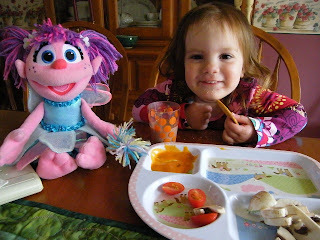 Abby is Aurora's new BFF and she joined us for lunch. 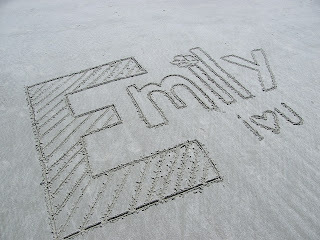 Isn't she cute! Later today, Aurora and Grammie will make Abby her very own Abby blanket. Stay tuned. I've really enjoyed my first week back at home. I can't believe how quick it's gone. After a couple of quiet "do nothing-recover from travel" days I have had some quality time in my sewing room. It's a disaster, but I have cleared a bit of room off my cutting table and ironing board and I have started to work on my "Must do by next Friday list". First thing I must finish is a baby quilt that I prepared back in February. I waited until the baby was born to finish it so that I could put her name on it, which I did today. I have the backing ironed, and the batting cut to size so I just need to layer, pin, machine quilt, and bind. I'm setting 3 hours aside to do this. I really want to have it done before I go have a visit with mom and baby next week. Next on my list is to machine quilt my batik beauty. I spent some time pawing through my stash for a great dark backing. 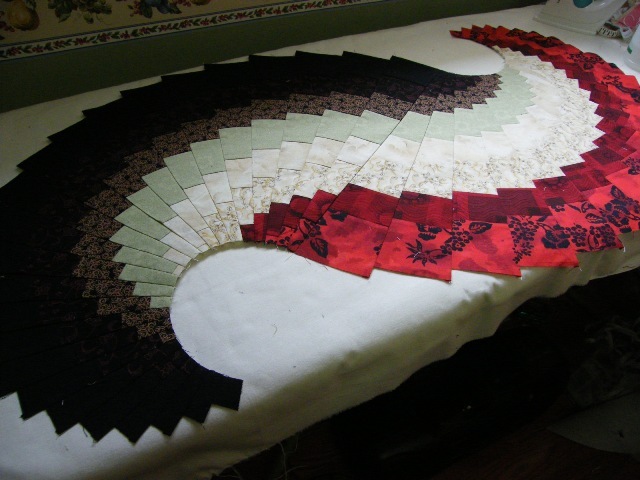 So it's all layered, pinned and ready to machine quilt. 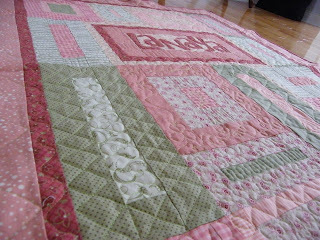 It will be done after the baby quilt. 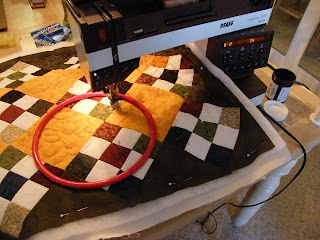 I'm setting aside an hour for the quilting and an hour for the binding. 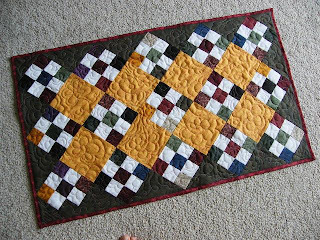 While this is not urgent, I saw a quilt that I couldn't get out of my head. Does that ever happen to you? 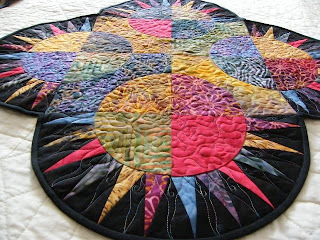 I have been thinking about this quilt and I was perplexed at how the quilt was made. So I tried a couple of things, and in the process I discovered a really neat design. I'm totally off my original thought and on to the revised design. Since I have a ton of scraps, I thought I'd go ahead and cut enough to make a full size quilt. 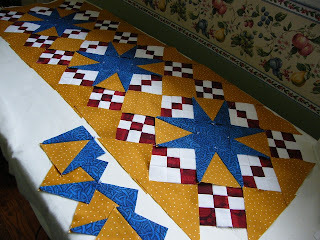 I don't intend to have the quilt done, but I would like to have the 400 small blocks done. Here is a picture of 250 of the 400 blocks needed. I'll set aside 2 hours for this. 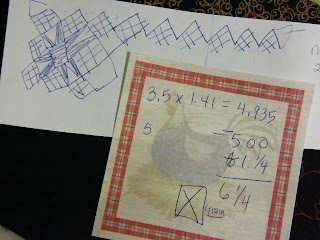 Lastly, before next Friday, I'd like to make a new table runner using my "never used" Tri-Recs rulers. Inspiration came from Joanne at Threadhead. This is picture of Joanne's runner using the Tri-Recs rulers . Don't you think it's fabulous? I'm setting aside 2 hours for this and I'd really like to have it on my table next Friday when I'll be hosting the Friday Girls coffee break. .
Did I tell you that I'm babysitting Baby Aurora from Saturday until Wednesday? I'm going to teach her to sew, so that she can help me with my projects this week. Even better than sleeping in your own bed, is pawing through your stash. 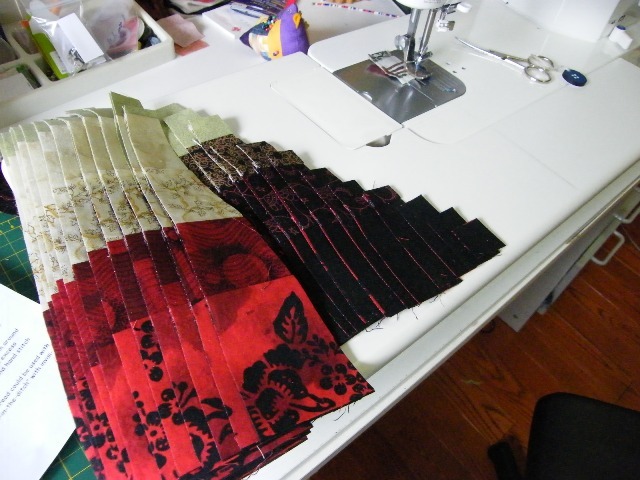 It was good to get back in my sewing room, just to refresh myself as to what I had on the go when we left. It'll be a day or two before I sew, but I am making a To-do list so I don't get overwhelmed. 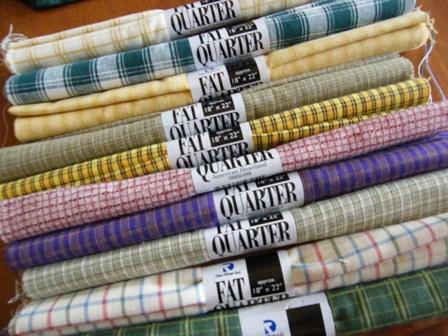 I came across these 10 Homespun Fat quarters in my stash. These are the only homespuns that I have. I need to find a pattern that will show them off. We're home. The 26 hour (3 day) drive was pretty uneventful. We had a bit of rain/drizzle for an hour yesterday but it was manageable. I did sudoku and operated the GPS and hubby did all the driving. We love our GPS. It took us on a different route that avoided a busy city in Connecticut. It was a breeze and we'll do it again next year. We saw many Canadian cars heading north. 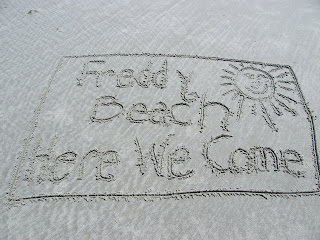 Snowbirds..
We arrived home mid-afternoon today to sunshine but cool weather. The grass is getting green, it may even need to be mowed in another week. It's cool. We may put a little fire on the wood stove this evening just to help us acclimate to the cooler weather. The house is just as we left it.. well, except for the dust, which has settled nicely on the surfaces while we were gone. But still it's good to be home in our own digs. We love our big TV. We just realized we missed it while we were gone. We are looking forward to sleep in our own bed tonight. The first night in 60 days. We had poached Atlantic salmon for supper, with asparagus and whipped potatoes. We haven't had that in two months. Tomorrow, Habitant French Pea Soup! Boy I missed that. My entertainment this evening is reading recent issues of Canadian Living, and Best Health, and Cooks Magazine. Hubby has already gone through the bills and weeded out what needs to be paid... (almost forgot about the house tax bills coming out last month) yuk. Still, it's good go be home! Our last few days here, we will be enjoying some sun. We use our sundeck in the mornings. Mert is watching for dolphins, birds, or interesting looking people. I'm exercising my brain by doing sudoku. Haven't done any for a while, so I'm enjoying the challenge. Afternoons are for the beach. 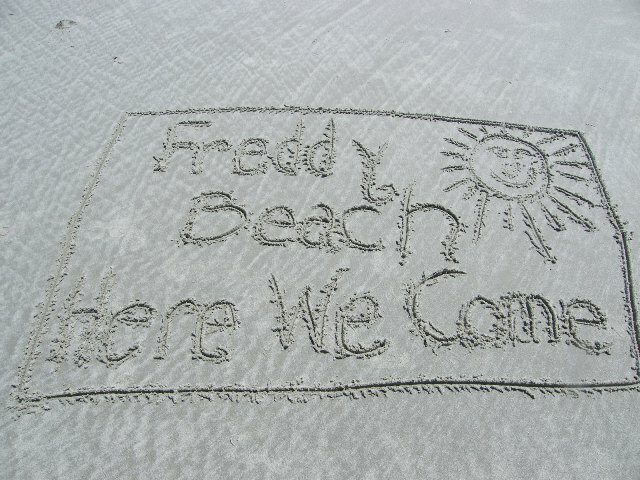 The beach has been perfect for making Sand Art for the kids. They are in order for the oldest to the youngest. I'm taking requests!! It's been a great week at the beach. On Friday, I was inspired by a table runner tutorial that Joanne did over at Threadhead, to use up the left over nine patches from my Lemoyne Star quilt. When I saw Joanne's tutorial, I decided I would make a quickie table runner. While I didn't use her tutorial because my nine patches weren't the right size, I sure got lots of inspiration from other table runners that she had done. I got the table runner done in no time flat, so I thought it was a perfect opportunity to keep going and free motion quilt it using my new Quilt Halo. It took me about 10 minutes to get used to moving the ring around, but it didn't take long to get the hang of it. I like it better than using gloves and it's so easy to reposition. 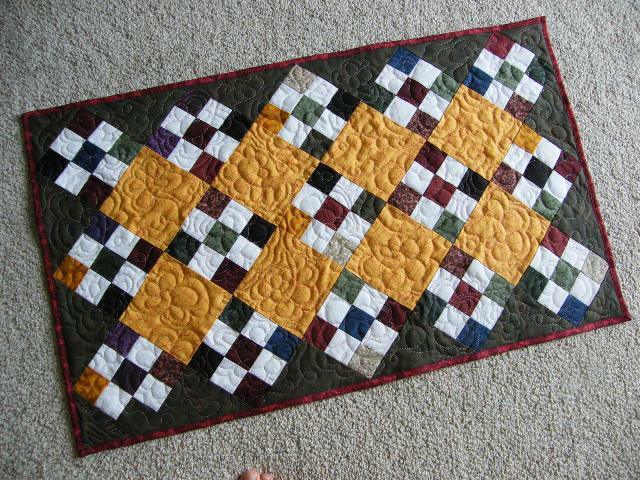 It took about 30 minutes to quilt this 20" x 30" runner. This halo is a keeper. I think the more I use it, the better I will get. Another 30 minutes to trim, and bind. It's hard to see from the top of the quilt, so here is the back so you can see how I meandered these flowers. This was just a little practice piece, so I have no intention of labelling it. Do you suppose this will do? Thanks for your inspiration Joanne. The minute I get home, I'm going to dig out my tri-recs rulers. Those runners are great. I made you a Sand Quilt! On this Good Friday, I'm wishing my Friday girlfriends a great coffee break today. Do you like the quilt I made you? 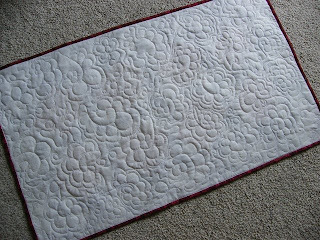 It's a new type of quilting that I invented. 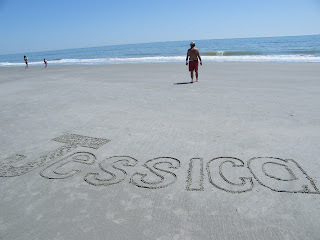 It's called sand quilting. All you need is a great beach and a long stick. I'll be re-joining you for our coffee break in 2 Fridays. I can't wait to catch up with all of you. I know it's April fools day, but this is no joke and I'm so excited to tell you. For those of you who follow American Idol, you'll remember Danny Gokey from last season. He was top three. Besides his great vocal ability, he's memorable because he's such a cutie pie. He touched a lot of people's hearts when he told of losing his wife at such a young age, just before he auditioned for Idol. He's playing here in Myrtle Beach at the House of Blues tomorrow evening and we have tickets. What a fun date hubby and I will have! (or should I say, "I'll have") I've been listening to Danny's new album all week so that I can sing along. I'm going to try to get my picture taken with him. I don't have much experience being a groupie so if you have any strategies on how to get a picture with him, let me know.